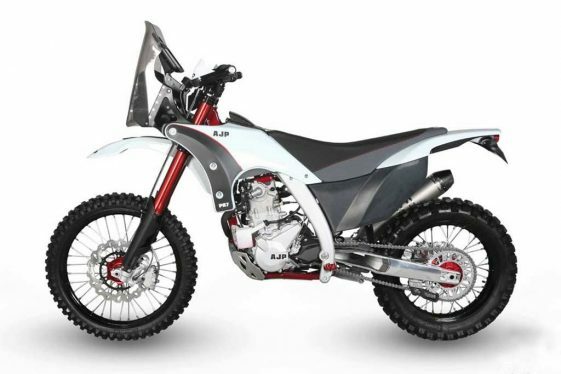  Get ready to blast across the desert at 100mph on the new PR7 Rally Bike. AJP has announced the availability of an off-road only version of the PR7 for the US. The new PR7 Rally 2018 model is packed with features and ready to blast across the desert at over 100mph, says the Portuguese manufacturer. Starting with a new generation frame, AJP has added a high-quality off-road front and rear suspension from Sachs, billet triple clamps, billet footpegs, and billet bar mounts. To keep the stand-over height narrow and low, AJP placed the fuel tank down low, under the seat. The rally-style tower incorporates a windscreen, dual stacked headlamps, and removable ASUS tablet computer that can handle any weather condition. What about the US arrival of the PR7 Adventure model? Seems like we’ll have to wait for that one even longer than the promised 2017 arrival. According to AJP a street legal version of this bike is possible for model year 2019, at the earliest. 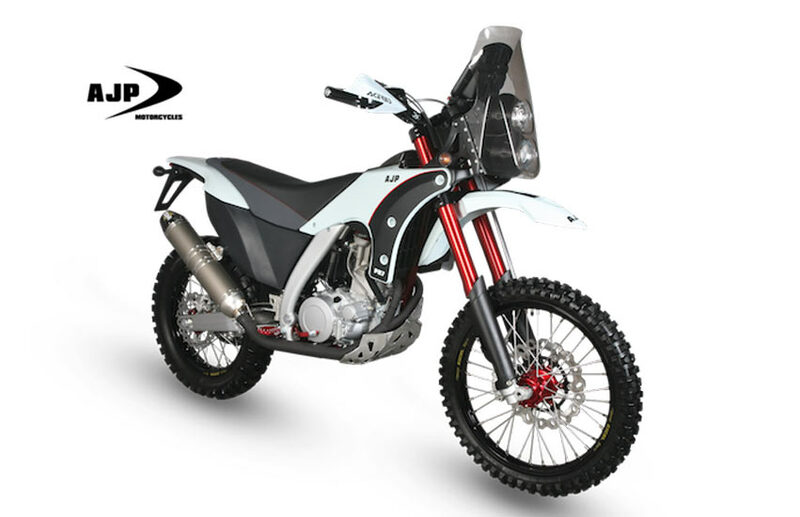 For 2018, all AJP motorcycles will have Shorai lithium batteries as standard equipment. The PR3 all the way thru the PR7 will now benefit from a 4-pound weight savings and plenty of cranking ability at all times thanks to Shorai Power. Plus, all AJP bikes will now be shipped with a first-fill of Spectro motorcycle oil for protection of every internal engine component from the very first ride. Pingback: The PR7 is officially coming to the U.S.
Another disadvantage: 92cm seat height makes it inaccessible for shorter people like me. Thats a bit heigher than a standard 690! I need to get out of the city before I reach the gravel, so every red light would be a challenge. Also stopping out in the woods on uneven ground would for shure result i a drop. In my opinion a dualsports bike should not have the seat height of a sports enduro but also be manageable in everyday life! I rode PR7 and didn’t have a problem with seat height with my 174cm of height. Arggg. Not emissions legal. A ten grand rally toy is a luxury. I would love to dirt tour something like this on the weekend then commute it on Monday. It seems like the whole adv light-middle weight bikes revolve around the year 2020. Same price as KTM, New to the segment? dealer network? Not street Legal? FAIL! FAIL! FAIL! FAIL! FAIL!!!!!! Seriously, why would anyone buy this bike? This is likely the result of the current EPA administration, strangling European manufacturers from importing product that need EPA approval. The EPA has decided that it’s more important to obtain concessions for Euro import of our beef export, ad so they have used this method as a “lever” against them. AJP has decided it’s better to offer *something* in the US market, in hopes that they can stay afloat. What puzzles me is, how did KTM manage to get their 2018’s into the US? They were being held up for a long time too, and now KTM product is appearing in my local showrooms? A long pipeline now somehow shortened by US dealerships making some kind of lawsuit threat? That has not stopped this kind of EPA behavior before. I don’t pretend to understand how they (KTM) did it. Can’t wait for the dual sport to come to the US IM INTERSTED hopefully I’ll be able to run it for the Las Veags to Reno desert race 2019 .. looking forward to this beast .